Click here for more information on this ride. Last edited by skywalker; September 8th 2009 at 16:32. Nice fitment! I noticed you've got the trailer hitch, what do you pull? Are you keeping it that height for the same reason? About the height: I changed the front strut too, because I had troubles with the old one. The wheels came of the road surface at some moments. The height with these new struts is equal to what it was. In the old set-up my tires could hit the fenders when not taken carefully a traffic island. And we have a lot of them in The Netherlands. Just have to see how this set-up holds. I am not going to spend a lot of time on my super, because I still have my unfinished split bus project. The change of the front struts was really necessary. I decided to change the discs and the drums to 5x130 for these Boxters, because this did not take a lot of extra time to do so. Hard circumstances indeed! Glad to hear you've got it under control! I think you made the right choice in who is your favourite. Looking great anyway. Do you have pics of the bus project? What are your plans for it? Of course I have pictures of my split bus restoration. On www.airmannschaft.nl I have a thread about my spit bus restoration. 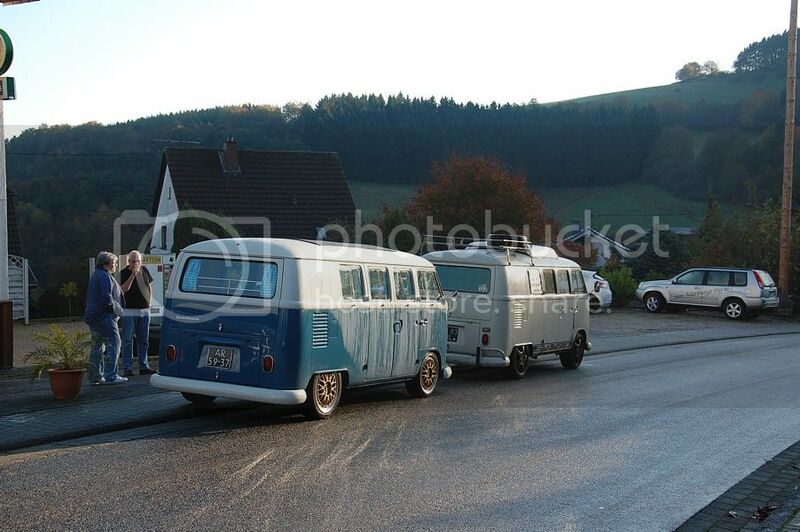 My splitty is going to be a “German Looker”, well forget the word looker: It’s going to be 'German'. Unfortunately it is in Dutch, but there are a lot of pictures. If any of you have questions, feel free to ask. Last edited by skywalker; September 8th 2009 at 16:41. Are those Martin's (Bug@5speed) conversion parts? Yes, that are parts provided by Martin. See also this post on this forum. Wow that's been a while. The split screen is finished and - of course - it's a German Look. With 17" BBS Le Mans the bus is looking even better !! No useless sh*t on my roofrack ! !